All ordinary citizens perform extraordinary acts of courage and bravery every day. Because the borders of the United States are protected by vast bodies of water and friendly neighbors, I’ve seldom thought of the impact of World War II on Americans at home. Recently I saw Dunkirk, the movie, which focuses on an incredible moment in British military history. The impact that ordinary citizens had on Operation Dynamo, as it was called, truly was a miracle. Between 300,000 and 400,000 British and French troops were surrounded by the Germans on three sides and the English Channel in late May 1940. They had little hope of returning to their native shores. Because of shallow water, the soldiers were being ferried from the beaches to awaiting destroyers, an excruciatingly slow process. On May 26 the British Ministry of Shipping requisitioned small craft with shallow draft all along the Channel coast for what was officially called Operation Dynamo. More than 700 private boats made up the flotilla that rescued more than 338,000 soldiers between May 26 and June 4, 1940. The contribution of civilians to this effort is almost unfathomable. Although many of the requisitioned craft were piloted by naval personnel, many civilian owners piloted their own craft in this heroic effort that came to be known as the Miracle of Dunkirk. Seeing this movie reminded me of one of my favorite childhood books, Taffy of Torpedo Junction by Nell Wise Wechter. Did you know that Germany came knocking on America’s front door right here in North Carolina in 1942? When the United States declared war on Japan following the bombing of Pearl Harbor, the Germans declared war on the United States and sought to take advantage of America’s poor war preparations by striking at the vulnerable merchant sea lanes just off the North Carolina coast. 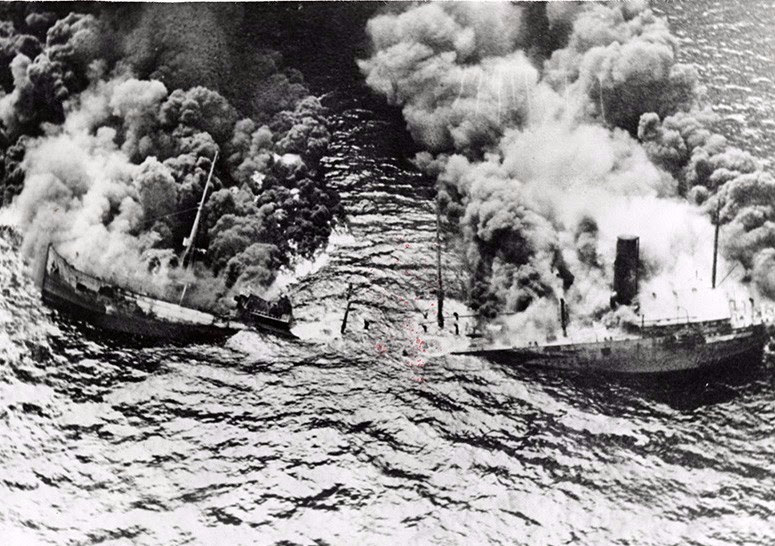 More than 80 ships were sunk off the coast of North Carolina between 1942 and 1945. The German U-boats were relentless during the first six months of 1942. Outer Banks residents would hear explosions day and night that shook their homes. The Coast Guard and civilians living on the Outer Banks were instrumental in rescuing survivors of ships that were sunk by the German U-boats. Coastal blackouts became mandatory and people were suspicious of anyone with a foreign accent. These were uneasy times along the North Carolina coast. The postmistress in the village of Buxton, on Hatteras Island, became leery of a stranger who brought in large wooden boxes to mail and alerted the FBI. They responded, traveling to the island and opening the boxes to discover detailed maps of the entire eastern seaboard. Ordinary citizens, just like those in England who participated in the Miracle of Dunkirk, impacted the war effort in North Carolina. And it is worth noting, that for all the death and destruction wrought by the U-boats, there was a humane side to these enemies. 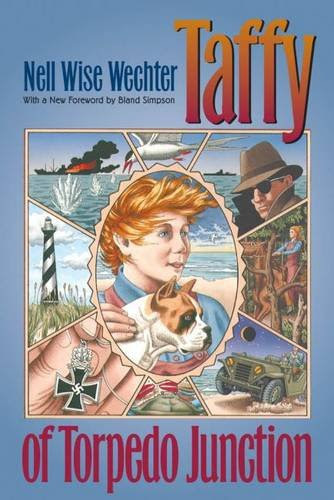 In a 2008 interview, native islander Carol Dillion, who was a child on Hatteras during the war and the inspiration for the character Taffy, said that the German U-boats didn’t harm local fishermen. One of the saddest byproducts of the tragic U-boat destruction was the oil spilled by the torpedoed tankers. It was estimated that 150 million gallons of oil spilled into the sea and made its way up on the beaches along the Outer Banks during 1942. Needless to say there was no swimming that summer. Sometimes, even today, small patches of blackened sand can be spotted on the beaches of the Outer Banks, a reminder of those massive oil spills in 1942. There are numerous articles and books, both fiction and non-fiction, that tell the story of World War II on our home shores. Dennis Rogers describes Taffy of Torpedo Junction as “The best piece of children’s literature ever produced in this state.” It tells the story of the early days of World War II and the impact on the ordinary citizens of North Carolina’s Outer Banks. It’s a great read for adults, as well as adolescents. A non-fiction book, Torpedo Junction by Homer Hickam, details the horrific impact of Germany’s Operation Drumbeat on American merchant ships off North Carolina’s coast in 1942. (Photo courtesy of the Outer Banks History Center, State Archives of North Carolina). Ordinary people performing extraordinary feats: it happens every day, not just in wartime, but in times of hardship or natural disaster as well. We see it in North Carolina, and around the world. When August nears its end, I’m always struck by the shift I feel. The days are getting shorter, schools are preparing to start, and my thoughts begin to envision warm days and cool nights. Though I’ll miss the delights of summer – warm sunny days at the beach with my granddaughter, delicious flavors of fresh peaches, corn, and tomatoes, relaxed dinners with friends, I find this calendar shift energizing. Late August and early September represent many new beginnings. I hope you enjoy the remainder of summer and welcome the change of seasons with joy and renewed energy. As you begin to plan your fall calendar please join visit NC concierge for our day trips to Seagrove and Winston-Salem.